It would levy a $27.20 fee on students each semester to create a fund for the descendants of 272 slaves sold by the university's Jesuit founders in 1838 to pay off debt. If approved, that money will go toward helping under privileged communities where some of the descendants live including in Louisiana. A vote held yesterday with the participation of 57.9 percent of students at the center of higher studies showed that two thousand 541 were in favor of the so-called Reconciliation Contribution, while one thousand 304 rejected the initiative, according to the Commission of Elections of the Student Association. University administrator Todd Olson didn't commit to the fund's establishment in a statement on Friday, but said the non-binding vote provided "valuable insight into student perspectives". "There are many approaches that enable our community to respond to the legacies of slavery", Olson said. The student-led proposal aims to atone for the Jesuit-organized sale of 272 slaves in 1838. Some Democratic candidates for president have also raised the issue of reparations - including 2020 Democratic hopeful Cory Booker. 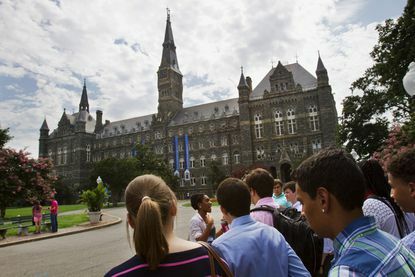 "The students remembered, recognized, and re-ignited awareness about descendants who literally made it possible for today's Georgetown University", Lee Baker, a GU272 descendant, told The Hoya.